Encore CNG | CSESCO INC. Maximize your fueling options; minimize your costs. 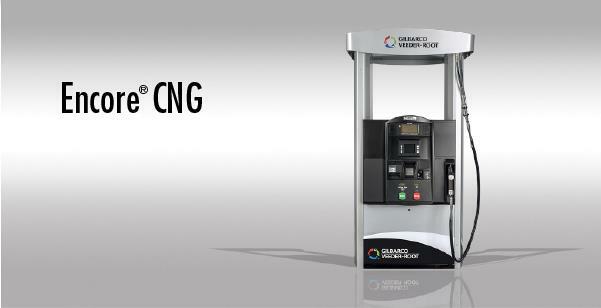 Gilbarco's Encore CNG dispenser makes it easy to bring Compressed Natural Gas to your forecourt. Integration into your existing POS and the familiar Encore user interface increase throughput and enhance your customers experience. Seamless integration. The familiar Encore frame and door construction allows integration into your forecourt with trusted Encore dispensers. The Encore CNG dispenser also ties to your existing forecourt controller, minimizing impact to your site payment network and saving you the cost of a separate POS system. Familiar user interface. The intuitive Encore user interface enhances the customer experience while shortening their wait time. Encore S and Encore 700 S models provide consistent options and payment features. Fast, safe and efficient fill. The new Sequence Control increases fill rate,improving throughput. External and manual shut off valves allow for continuous flow of gas to the vehicle until stopped by the electronic flow control system or stopped manually. And with the carbon sensor in lieu of a cabinet purge system, you minimize your operational cost while maintaining a safe fueling environment. Flexibility at the gaspump. Now you can have one dispenser for hi and standard flow applications, giving you the flexibility to fill cars or busses from the same fuel dispenser. Compressed natural gas (CNG) is a highly pressurized fossil fuel that acts as an alternative to gasoline, diesel and LPG. Popularly known as the green fuel because of its environment friendly characteristics and being extremely cost effective in comparison to gasoline and diesel, CNG is quickly turning into the most preferred alternative fuel around the world. And in line with Gilbarco's commitment to offer its customers superior and future-ready equipment, the Encore series is a one-of-its kind unit that offers the broadest set of flexible fuel options. The re-designed Encore retains all its primary features and comes with added environment friendly alternatives. Fully equipped to dispense up to six different fuel types namely unleaded gasoline, diesel, CNG, biodiesel, E85s efficiency. The Encore series is well known in the industry for its low-maintenance and high-return-on-investment proposition and the added capability to dispense environment friendly fuel is the ideal way for you to associate your enterprise with the green initiative and maximize your branding and sales opportunities. And all this comes to you with the unmatched durability and reliability you have come to expect from the industry leader in flexible fuel. Your Complete Petroleum Service and Sales Company. CSESCO INC. 2015 All right reserved. Powered by SquareHook.